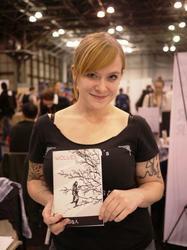 Becky Cloonan is an award-winning cartoonist and illustrator who started self-publishing mini comics in 1999. Since then she has gone on to work with Vertigo, Dark Horse, Harper Collins and Marvel, with editions of her work published in several countries around the world. She still tries to self-publish a new mini comic every year.